My seeds have arrived. I have weeks and weeks before I can mix a wheelbarrow full of potting soil, form them into soil blocks and adorn each dimpled depression with a beautiful seed. What to do in the meantime? I enlisted Husband’s tripod and camera, then Youngest Daughter’s camera, and a gray textured matte board, and began to photograph my beautiful seeds. It took me most of yesterday afternoon. It took me almost two hours to size the photos. A brief weekend season well spent! I began my day in the ice-filled woods, struggling to walk on roads covered with 3 inches of smooth unbroken ice. Even MacKenzie had trouble walking. Only the yaktrax on my boots kept me upright. I couldn’t look up because I was so busy looking down, putting one foot carefully in front of the other. If I didn’t look down, I reasoned, I wouldn’t remain upright. This effort robbed me of any chance to think on my walk. Only my body was exercised today. And so the only seeds I want to consider today are flower seeds. I cannot imagine the world ever being warm enough for me to set these seeds out. And yet seeds, like the changing seasons, hold promise. I will enjoy the beauty of these miraculous seeds, germs of promise, and look ahead to the next season when their promise is realized. 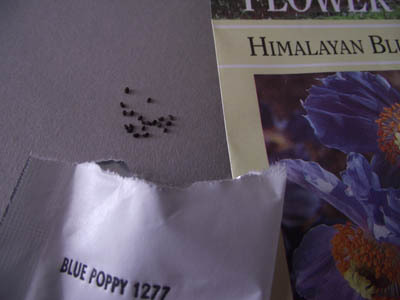 Tiny tiny poppy seeds, that will be planted on the slope garden in front of our house. The petals the color of the spring sky, and the eye the color of the gentle springtime sun. And destined for both my vegetable garden and the slope garden, the colors of summer itself: Calendula. More on this remarkable blossom in a post devoted to herbs and their many uses. I love the dramatic difference in size, shape, and color of seeds. The poppy seeds are tiny black balls, almost impossible to sow. 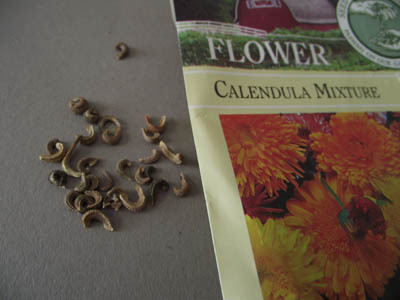 The calendula seeds look like curled caterpillars, dry, lined, and shades of cream and brown. Why is it that perennial seeds are always so tiny and so very difficult to plant and germinate? Why is it that annual seeds are always larger — easier to see, sow, and handle? Is the lesson here that things that last take more care and attention at the beginning?